My Dirt Road Anthem: A Click Review and ...Giveaway! A couple months ago I won two sample packs of Click on a giveaway and really liked it so I was excited when I was given the opportunity to get to do my own review and giveaway. I was sent a shaker ($7.95), carton of the Mocha ($26.95), and two sample packs of the vanilla latte flavor ($2.95 each). In case you haven't heard of it yet, Click is the coffee lovers protein drink. It comes in two flavors Vanilla Latte and Mocha. 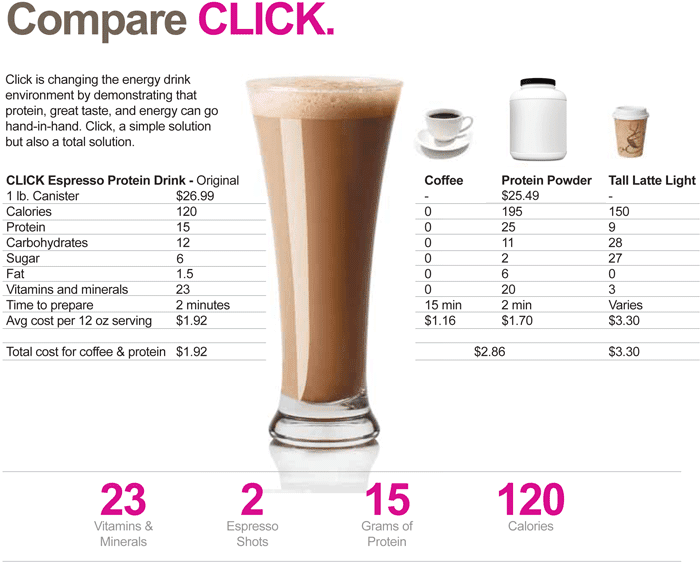 I found this great graphic that compares Click with coffee, protein powder and a tall latte with skim milk. So what do I think about Click? I wish they would come out with a Click light, or one with half the amount of caffeine. I don't feel like I always need two shots. A lot of my energy gels also have caffeine in them so I worry that drinking Click to energize before a run and then eating gels with caffeine is adding up to a lot of caffeine. I guess I can always make it with one scoop of powder and half the water. (Why didn't I think of that before?) Of course then I am getting half of all the great stuff in it! Quick and easy to prepare. Two scoops, add water, shake, drink! It is good hot or cold. Lots of great recipes on their website for variation. I love coffee! Both flavors are great although if I had to pick one I would go with Vanilla Latte as my favorite! I think I would like the vanilla the best. Love coffee but like it on its own without other additives. I love the mocha flavor. I bought some through bodybuilding.com and fell in love with it. I do want to give a CLICKtini a try! I love coffe and any flavor of coffee would be fantastic. I just wish I could buyit here in Canada at a store. I would def love the coffee flavor- mmm mmm tasty! I would love to enter but I heard they will not ship to Canada... do you know anything about that? I really want to try this. I have heard lots of good reviews. I would choose Mocha for sure! honestly BOTH flavors sound amazing, but if i had to choose one, vanilla latte! I would love to try the Mocha flavor! I would try the mocha! Mocha all of the way! Darn - accidently hit anonymous! the mocha flavor sounds delicious! The mocha sounds really good! I love both mocha and vanilla lattes....so I'd have a hard time choosing. I think I'd go with vanilla latte though! I really want to try the Mocha! I would love to try Mocha! I would pick Vanilla Latte for sure...I love all things vanilla! Mocha baby! All the way, MOCHA!!!! Thanks for having this giveaway :) Dying to try this product. It's all over the blogs I read. I'm a night nurse and can use all the extra zip in my day along w/ protein to fuel my runs. I really want to try the Vanilla Latte!! I heard it's great. I think I would like the mocha. I have been wanting to try this stuff forever. I would like to try both, but I think I'd have to go with the vanilla latte! Surprise me...I would love anything! Oh I'd love to try Click, both flavors sounds delicious....but I'd prob pick Mocha? I would definitely love Mocha but any flavor sounds good! Thanks for the review! I would love to try Click! Ooh pick me! I really want to try Click, especially the Vanilla Latte flavor. I'm out of Mocha so I could use more of that flavor! I love Mocha... would love to try Vanilla!